The stunningly designed Mountlake Duvet Cover adds a magnificent touch with its elegance that will complement any style bedroom in your home. 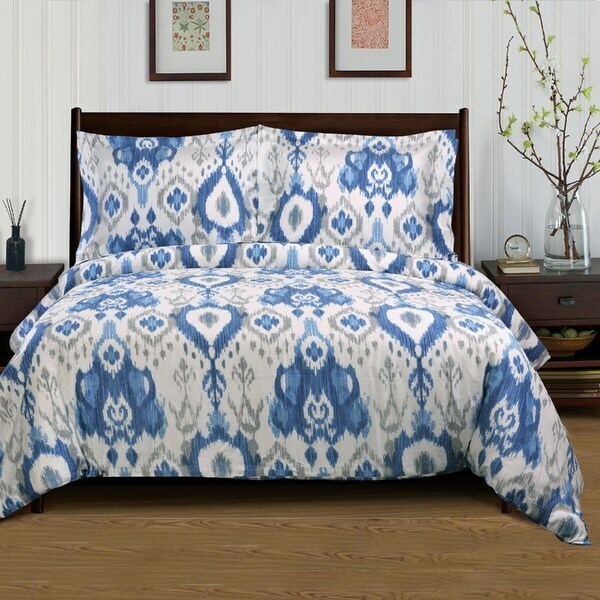 Always relax in exceptional comfort and sophistication with its rich blue tones and beautiful printed design This 300 thread count duvet cover is made with the highest quality 100-percent premium cotton at an outstanding value. You can mix and match any solid color sheets and pillowcases to your style preference from our bedding collection sold separately. This duvet cover is great...but I will agree with other reviewers that the pattern is on the wrong way if you want your king sized duvet to lay on the bed correctly. The button closure is on the long end of the duvet which means for the pattern to run like this photo, your bedding will have to be on the bed wrong. Very odd but it was inexpensive and goes well with my room color. The fabric is also a pretty good quality and the colors are bright. I searched all over for a King duvet cover for my beach house. I wanted something light but not 'beachy'. 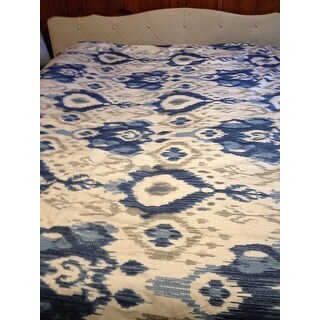 This ikat duvet cover was perfect! The design is flipped so if thats important to you- keep looking. But I love it. Soft and pretty. I love this ikat duvet cover set. It looks great when added to the bottom of a bed as an accent to a white coverlet. The only reason I gave three stars instead of four or five is because the ikat print on the duvet does not run the correct way. It runs opposite of the shams. As I just have my folded at the bottom of my bed, it works great. This duvet does not have duvet ties. We needed to bring some blues into our beach house master that is mainly beiges and whites. This cover is perfect and adds just the right punch to the room. Very pretty. Color is as in the picture. Fabric is good quality. As indicated in other reviews, the Ikat design is not as pictured, and rather than running from head to toe on the bed runs from the left to the right side. I wish that the fabric were a little bit thicker. And we are finding that the colors are fading a bit when washed. However we are using the duvet cover and it does look nice. Wonderful duvet, it met all of my expectations! The pattern does not go the way shown in the picture. It goes side ways. Im totally fine with it. I love the pattern, colors and the material. Made very well. Nice feel to it. It's soft, pretty and is a real statement in the room. "Can you confirm the colors in this pattern? Blue and grey or blue and taupe?" It is blue and gray. This duvet is not reversible. The same fabric and pattern is reflected on the reverse side. "I ordered thie Mountlake duvet set, and it is beautiful! I love a good Ikat print. The problem is that the Ikat print on mine runs across the width and not head to foot as the photo depicts. This run of the print is also 90 degrees off the print on the shams. Is this a one off defect, or are all of the Mountlake King duvets going to be like this? (on a Queen size it may not be as noticeable because the dimensions are almost square). I would like to exchange for a duvet without this defect."